Today, the Diyarbakir Public Prosecutor’s Office revoked the blocking order issued by the Diyarbakir 5th Criminal Court of First Instance on 14 January 2011 with regards to the popular Blogspot platform used by millions of people around the world. The decision will now be communicated to the Turkish ISPs and access should be back to normal within the next few days. 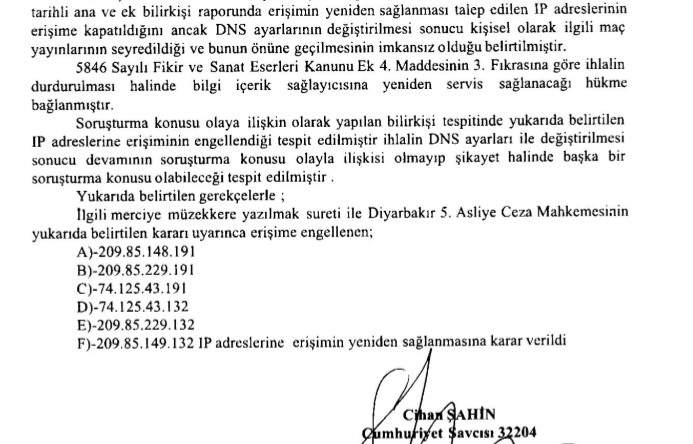 Cyber-Rights.Org.TR orchestrated several appeals representing a Blogspot user based in Turkey and these appeals were lodged three days before Google managed to lodge an appeal with the Diyarbakir Public Prosecutor’s Office. As the allegedly infringing blogs (goltvnet.blogspot.com, sportrhd.blogspot.com, trgoals2.blogspot.com, freesoccertrhd.blogspot.com, and izleligtvblog.blogspot.com) were removed by Google there was no further need to block access to the Blogspot Platform. A Court dealing with the appeal requested an expert opinion with regards to the claim of removal of the above mentioned blogs and the expert report backed the claims made by our legal team representing İdil Elveriş, the owner of travelmind-idilka.blogspot.com. Be the first to comment on "Turkish Blogspot Blocking Order has been revoked"